First let’s demystify the term polycarbonate. Polycarbonate is a type of plastic, not a method of construction or manufacture. Therefore even if polycarbonate plastic is used in the vacuum/thermoforming process they will still possess most of the shortcoming of the vacuum/thermoforming process. Just because it is made with polycarbonate plastic or called a "polycarbonate mold" doesn’t make it a high quality Micelli injection molded polycarbonate chocolate mold. 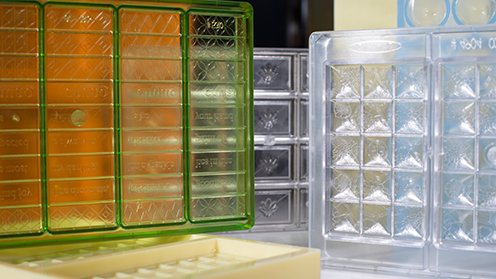 Be informed – ask specifically for "injection molded" polycarbonate chocolate molds. Injection molding is used to produce the most sought after molds for specialty Artisans chocolatiers and bean to bar manufacturers. Plastic polycarbonate pellets are melted at very high temperature above 500 degrees F.
Molten plastic is injected in liquid form into a 2 part steel/alloy metal die under extreme pressure (upwards of 20,000 PSI). Finished molds ejected from the steel mold and are a rigid, stable, extremely durable product. Plastic type is exclusively polycarbonate in our injection molding process for chocolate molds. Advantages- Very fine details, sharp images, superior surface finish & textures, rigid flat top surface, longest mold life(avoids replacements), ability to be used on automatic depositors/molding lines, washable in dishwashers /industrial washers. Injection Molding Vs. Vacuum Forming - Watch Video Above! This is a process of manufacturing that is used to produce lower grade chocolate molds, prototype molds or molds for the craft industry. Plastic starts as a sheet and is suctioned over a positive die under relatively low pressure 15 to 60 psi. Plastic type can be PET or polycarbonate. Disadvantages — unstable inconsistent surfaces, not flat/wavy top and sides, not sturdy/rigid, much shorter mold life, limited detail, inferior surface finish, low rigidity, low tolerance for repetitive heating/cooling cycles.